Masai Mara boasts 1,672 sq. kilometers of unspoilt wilderness. It offers the best game and bird-viewing not only in Kenya, but anywhere in Africa. The views across the rolling golden grasslands studded with acacia trees, rivers and forests are dazzling, the sense of space overwhelming. Throughout the year the Masai Mara is a place of natural drama, a kaleidoscope of colours and life. Most stunning of all are the months between July and October, when the savannah teems with animals during the Great Wildebeest Migration. Millions of wildebeest gather in the Masai Mara in one of the natural wonders of the world. Staying in one of the Governors' Camp properties puts you right in the heart of the action, closer than anyone else to its incredible sights and sounds. The adventure begins just before dawn. Departure is from a perfect natural launch site and flames from the hot air balloon burners light the darkness as the crews inflate their craft. The first, pink tongues of sunlight flicker across the skies as the hot air balloon fills, then rises. Suspended in a basket beneath the rainbow-coloured canopy, you’re off for a wildlife viewing adventure with an entirely different perspective. What amazes most first-time balloonists is the absolute stillness: the silence as you float above the plains, the forest and the rivers of the Masai Mara. Even if you’ve flown elsewhere, this is a unique experience. The flight lasts an hour or so, drifting wherever the air currents take you, and with ample opportunities for photography and video filming. 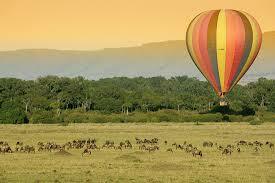 Then your Kenyan Hot Air Balloon Safari finishes with a flourish. In the time honored tradition of balloon flights the world over, you toast your return to earth with a champagne breakfast, cooked wherever you land. The Balloon Safari ends with a transfer back to camp or lodge.